You can make a video recording of your computer screen. In the QuickTime Player app on your Mac, choose File > New Screen Recording. Microphone: Choose None to record your screen with no sound, or choose a microphone. Options: Choose Show Mouse Clicks in Recording so that clicks you make during the screen recording appear as a circle in the video. Click the Record button , then choose a recording type. Click once anywhere on the screen to start recording the entire screen. Drag to select a portion of the screen to record, then click Start Recording. For example, you can drag to select just a specific window. 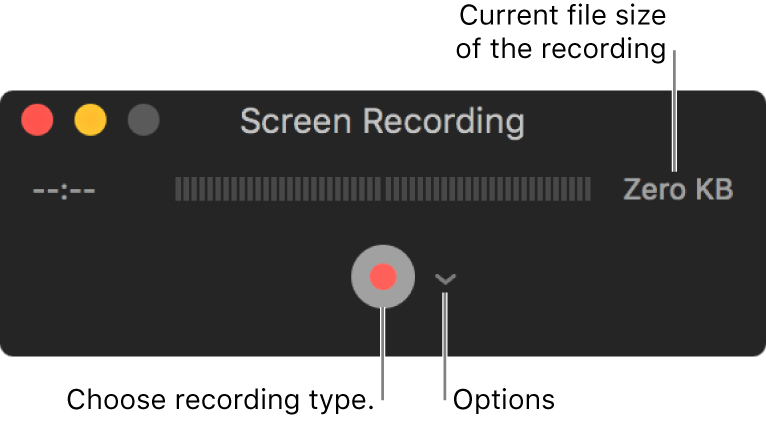 When you’re finished recording, click Stop in the menu bar (or use the Touch Bar). Choose File > Save, then enter a name for the recording.